In this blog post I am presenting two sets of documents. The first is the Wiking Panzergrenadier Division Organization dated March of 1943. 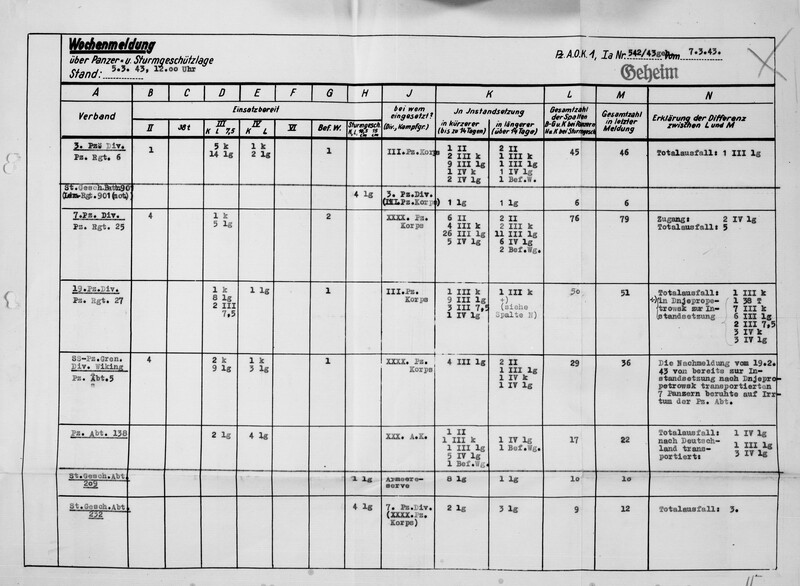 The second are Daily Status Reports for the 1st Panzer Army. I usually collect any K.St.N. lists I come across just to get an idea of how they might have compared to other units. I knew little of the Wiking Panzergrenadier Division so I decided to see what kind of back ground information I could find. 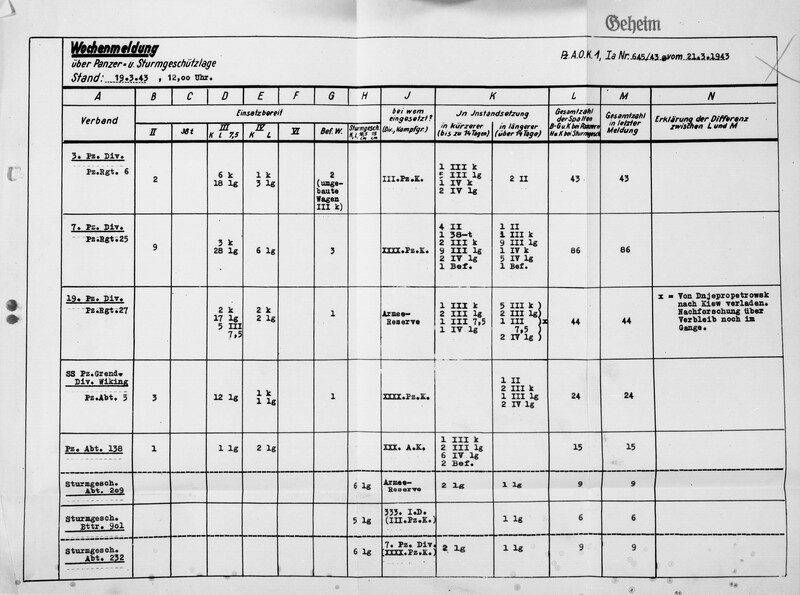 The result was the second set of documents that are the March 1943 Daily Status Reports for the 1st Panzer Army. Also, below I provide some Panzer status reports and a vehicle inventory for Wiking. The winter of 1942/43 did not favor the German army. The attack by von Manstein’s 4th Panzer Army in December, Operation Winter Storm, though it made some initial progress fell well short of its objective to relieve the beleaguered 6th Army in Stalingrad. Subsequent successful Russian offensives pushed the Germans out of the Caucasus. The Germans found themselves back to where they were almost exactly a year prior. 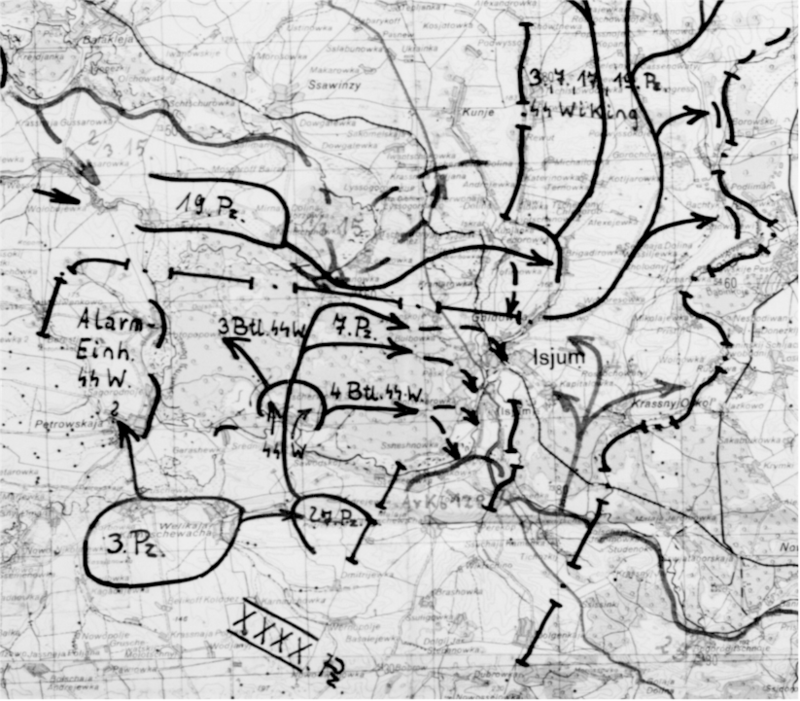 In May of the prior year (1942), the Russians launched an offense south of Kharkov in an attempt to expand upon their gains from their winter offense. The attack was launched against the German 6th Army in the Izium salient. The German counter attacks ended up encircling and capturing about 240,000 Russian prisoners. 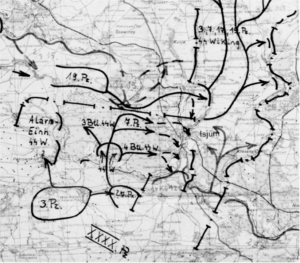 See this post for more information and maps of The Second Battle of Kharkov. The Panzergrenadier Division Wiking, which had been under the 4th Panzer Army during January and February of 1943, was now part of the XXXX Pz. Korps under the 1st Panzer Army. The 1st Panzer Army found itself just south of Izium. Once again, the Germans were preparing for counter attacks against Russian offensives that kept pushing the Germans further West, this time with the 4th and 1st Panzer Armies. These operations saw the German SS Panzer Korps recapture Kharkov. This bacame known as the Third Battle of Kharkov. 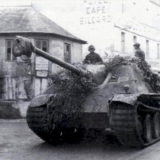 The 1st Panzer Army attacked from the south and would capture Izium. In the map below Wiking is identified as SS W and SS Wiking. Full map can be seen here. As can be seen in this order of battle from Tessin the Wiking Division operated only in the east. For a great deal of the time it was in Army Group South and subordinated to the 1st Panzer Army. 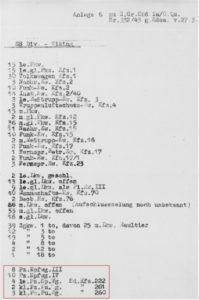 The organization documents that can be downloaded below indicate this as a reclassification of the division from SS-Division “Wiking” to SS-Panzer-Grenadier-Division “Wiking” and dated March 29th, 1943. Other online sources show late 1942 as the period for this change, but I did not find any documents to substantiate that. As typical for many units in early 1943, the organization was composed of mostly 1941 KStN’s. 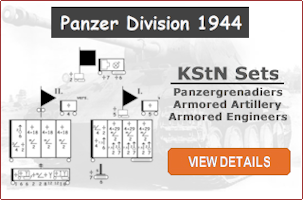 Although the typical Panzer Division of this time had a few KStN dated 1943. 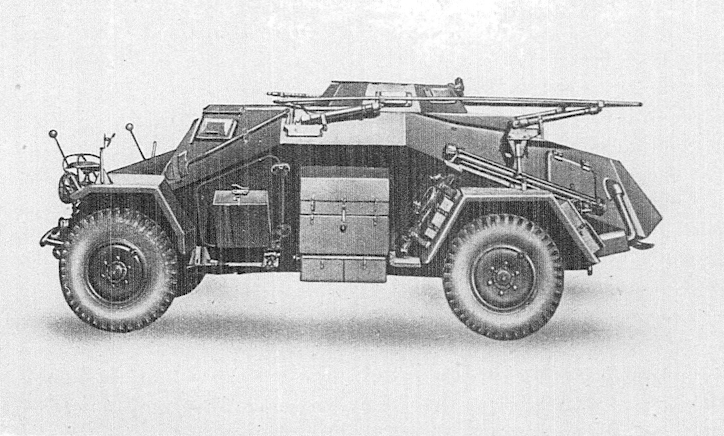 You will also notice that this KStN list and Gliederung do not include a Panzer Abteilung. I tried to locate some additional information for this but could not locate any. 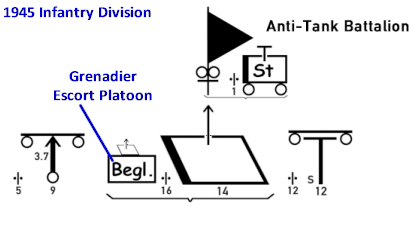 I’m not sure why you would classify a division as a panzergrenadier division and not include the panzer battalion. 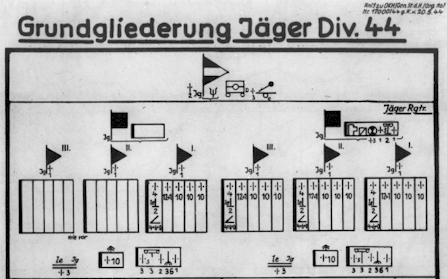 However, documentation for this period does show that the division did have tanks assigned to it under the SS Panzer Abteilung 5. 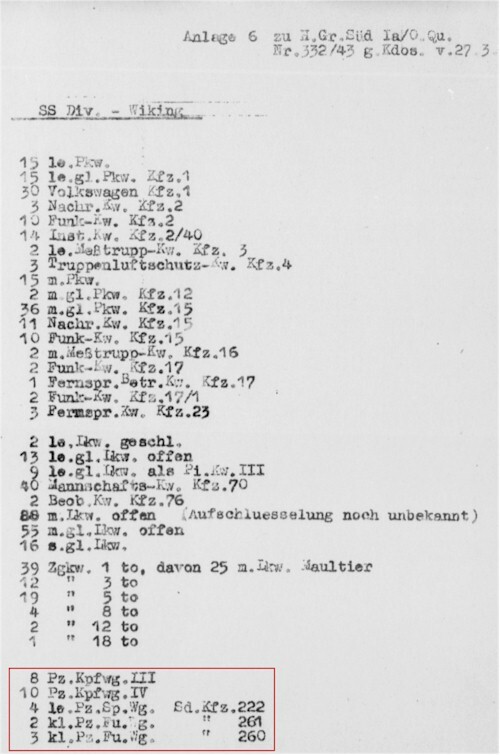 The inventory list below shows 8 Pz.Kpfwg.III’s and 10 Pz.Kpfwg.IV’s with the division on March 27th, 1943. 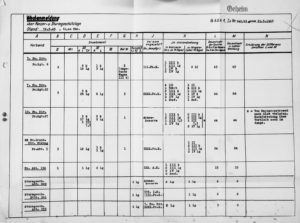 Also, in these Panzer and Assault Gun status reports below we can see a more specific breakdown of the Panzerkampfwagen versions as either long or short barreled. The chart also shows which are in short- or long-term repair. As seen from this entry in Tessin, for November 9th of 1942, the division had the Panzergrenadier Regiments Germania, Nordland and Westland, as well as SS Panzer Abteilung Wiking. In the summer of 1943 the division would lose the regiment Nordland. The Nordland regiment would be used to form a new division of the same name, 11. SS-Panzergrenadier Division Nordland. In October of 1943, the division was designated the 5. SS Panzer Division Wiking with the SS Panzergrenadier Regiment 9 “Germania” and SS Panzergrenadier Regiment 10 “Westland”. 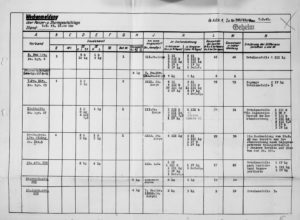 For additional information (KStN and organizational diagrams) on SS units please see this related post on 1942 SS Unit Organization. Hey Doug. Thanks for the extra information, those are great details. I don’t have any of the SS division rolls and so had to rely on the Corps and Army rolls for information. I agree that late war records are sparse and many of my searches usually end in disappointment.